Natural Detox Diet Reviews – Which Detoxification Diets Are Safe and Healthy? Which Detoxification Diets Are Safe, Healthy and Effective? A natural detox diet should leave you feeling lighter, more energised and clear-headed. How do they work, and which ones are safest and most effective? If you try to sift through all of the information out there about natural detox diet plans, whether it be online, through friends, books, or infomercials, it is easy to become overwhelmed. How do you know which is the best whole body cleanse, what is really safe for your body, what is effective and what may be just a marketing scam or fad? The following are some tried and true natural detox diet plans that you can feel confident about trying. Some may work better for certain bodily constitutions than others, so if one does not feel right for you, remain open-minded about experimenting with a different one. Try a different natural detox diet at the start of each new season, until you find the best whole body cleanse for you. The Master Cleanse System, or lemon juice detox, is one of the most publicised and well-known detoxes. It’s been made famous by certain celebrities who use it more for rapid, temporary weight loss than a detox. The master cleanse system is an intense detox which can be done for anywhere from 3 days to more than 20 days, although somewhere in between 3 days and a week is most advisable. In this detox plan, you drink a mixture daily of 60 ounces of filtered water, 12 tablespoons of fresh squeezed lemon juice, 12 tablespoons of organic grade B maple syrup and ½ teaspoon of cayenne pepper powder. The lemon helps to cut toxins and accumulated fats, the maple syrup helps to maintain your blood sugar levels, and the cayenne keeps your metabolism from falling. As the master cleanse system is an intense detox which will unearth and release many accumulated toxins into your system to be processed, a saltwater flush is recommended every morning to help move toxins out quickly. One quart of lukewarm water mixed with 2 tablespoons of sea salt, taken first thing in the morning, will act as a strong laxative to thoroughly flush out your intestines. This is an intense detox which will allow you to shed pounds quickly (although once you begin to eat solid food, you can expect to gain back most of the lost weight), will allow your organs to rest, and will profoundly clear out your digestive system. The intensity and the velocity of the detox has your body dealing with so many old toxins at once that you may have symptoms such as headaches. This detox is not suitable for diabetics. Following a macrobiotic diet in general detoxifies the body over time, and is a safe and gentle way to bring the body into balance. The macrobiotic diet prescribes consuming neutralising, cleansing foods that are full of nutrients and fibre. A macrobiotic detox will follow the foods and principles of a macrobiotic diet, but will be much more focused and limited in its scope. An example of a macrobiotic detox would be to consume for one week nothing but brown rice sprinkled with cleansing seaweeds, and drink nothing but filtered water and bancha tea. Macrobiotics is also about cleansing yourself of old, negative patterns and addictions with food. By practicing concepts such as chewing each bite of food until it is completely liquid in your mouth you learn to enjoy the act of eating, to savour taste and to be conscious about how you are nourishing your body. Including solid foods in a natural detox diet is helpful for people that are expected to maintain a normal schedule involving work, parenting and other errands during the day. You can maintain your energy levels. Additionally you avoid the drastic release of toxins in your body that can cause headaches and other symptoms when toxins are unleashed too quickly for your body to process. A macrobiotic detox will also bring your body’s pH into balance. Some people find the food choices of a macrobiotic detox too bland or boring. Others want a quick fix and do not want to deal with having to think so conscientiously about food and how it makes their body and mind feel. Whereas you can drink other detox concoctions while driving down the road or while at the office, sitting down to thoroughly chew a plate of brown rice takes time, patience, and commitment. An Ayurvedic cleanse is something that is best done under the supervision and with the guidance of an Ayurvedic specialist. To begin, you must know your specific Ayurvedic constitutional type, whether it be kapha, vata, or pitta. The type of cleanse and herbs that will be most effective for you personally will depend on your Ayurvedic type. Kapha folk will need more help clearing out old accumulated fats and toxins. Vatas will need to focus on foods that help to nourish and balance the organs and centre the nervous system. Pittas will need to cool down, flush out and clear out blocked and aggravated energy channels. Ama is the word for accumulated gunk in your system, and Ayurveda aims to clean it out in many ways. One of these is tongue scraping. Ever noticed some white or yellow residue on your tongue in the morning? It’s toxins that have risen to the surface overnight and should be discarded instead of being put back into your system! Herbs are frequently used in Ayurvedic detox. Techniques include massage with different herbal oils, herbal laxatives, enemas and even purging to help clear out toxins in the stomach. Indian Sarsaparilla and Manjistha are commonly used Ayurvedic detox herbs. These are highly effective in flushing out toxins from the liver, blood, sweat glands and elimination system. Other herbs used are Tinospora Cordifolia, Rose Petals and King of Bitters to help balance and purify the liver. Red Sandalwood, Vetiver and Neem Leaf strengthen purification of toxins through the sweat glands and the skin. An Ayurvedic detox will be personalised to suit your specific needs. It is a holistic approach that will address detoxing through all of the body’s systems, not just the digestive system like some other detoxes. You should first consult with a trained Ayurvedic professional. Also, some of the herbs may be difficult to find at your local health food store. Extreme measures such as enemas and purging may be too overwhelming for those looking for a gentler detox. A popular detox is the 7 day detoxification diet. It allows you to eat simply for 7 days whilst avoiding heavy fats, alcohol and dairy. At the same time you ingest concoctions of many powerful detox herbs that target each of your organs, such as dandelion root for your liver, cranberry for your kidneys and parsley for your gall bladder. Chromium polynicotinate helps to burn fat and keep energy levels high, fennel seed expels old gasses, and oat bran fibre helps to keep digestion moving along. The strengths of these herbs are very high, much higher than you would find in some other capsules. Also, some of the capsules may contain over 30 different herbs. It is said that within a week, you can expect to lose weight and have your organs functioning better than ever. How much more simple can it get? All you have to do is eat a balanced, clean diet and pop some pills! People tend to see the 7 Day Detoxification Diet as a quick fix where they do not have to change anything about their long term eating habits. It’s wishful thinking to hope you can simply pop a few pills and years of bad habits and toxins will just disappear! Common sense tells us that the most effective detoxes and cleanses need to happen on many levels. A natural detox diet that permits questionable eating choices is not going to deliver a holistic detox result. These are just a few of the many natural detox diet choices out there. As important as detoxing our bodies is, remember that one of the most effective things that you can do to clear out toxins in your body over time is to implement healthy daily eating habits. This includes consuming lots of fresh fruit, vegetables, whole grains and pure filtered water. Regular exercise, lots of fresh air and maintaining a positive attitude also go a long way in clearing out the old and making room for the new, more vibrant you! 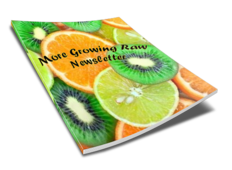 Back to Growing Raw Healthy Eating Guide home from Natural Detox Diet Reviews – Which Detoxification Diets Are Safe, Healthy and Effective?